Posh star Marcus Maddison takes on Oxford's Cameron Brannagan. Photo: Joe Dent/theposh.com. 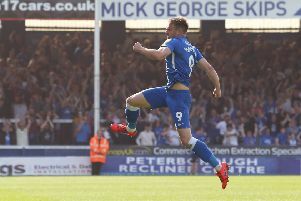 Top scorer Jack Marriott and assist king Marcus Maddison did what they do best for Peterborough United at Oxford United today (March 17), but it wasn’t enough. Posh went down 2-1 in awful conditions as too many players suffered an off day. Posh striker Jack Marriott salutes the visiting fans after his goal at Oxford. Photo: Joe Dent/theposh.com. Liam Shephard in action for Posh at Oxford. Photo: Joe Dent/theposh.com. Chris Forrester: (for Ward, 46 mins).